Full of beautiful lakes and waterfalls, Laguna is a great nature spot close to Manila. The province is extremely developed and full of interesting tourist spots. The best thing about Laguna is its diversity – with many attractions and popular sites for you to choose from. You can visit Laguna as a day trip from Manila, or spend a few nights there. It all depends on how many things you wish to see, and how much time you have. Read our full guide to Laguna, add any item you like to your wishlist and let our agents plan your tour itinerary. All of our Laguna tour packages include transfers from and to Manila, accommodation and guided tours. The day tour leaves very early in the morning, between 6 and 7 AM, and you’ll be back at Manila around 6PM. It includes hotel pickup and drop off, and usually people who take this tour choose to go to Pagsanjan Falls and its surrounding area. The tour can also be combined with a stop at Taal Volcano – contact us for a quote. Overnight Laguna packages offer much more flexibility, and a chance to enjoy the many nice resorts in this province. It will allow you to spend more time at each location, and enjoy all attractions to the fullest. Longer stays are also possible, as part of our custom package service. Laguna is one of the most tricky places to pick accommodation at. Hotel names are misleading and many lie about their star rating as well. Many so called “resorts” are actually cheap hostel rooms with a public swimming pool and an egg and rice breakfast. There’s no need to worry though, since there are quite a few decent hotels all throughout Laguna. These are mostly concentrated in major municipalities such as Lumban, Calamba, Santa Rosa and San Pablo City. We’ll suggest the right places, based on your activities and budget. Since Laguna is very tourist oriented, it’ll be easy for us to find a resort to match your standards. Everything from cheap hostels to luxury 5 star hotels is available. Extra tips : it’s hard to find ATMs so bring some cash with you. Unless you stay at one of the fancier hotels, don’t rely on their food. Speak to us for restaurant recommendations instead. There are 5 different bus companies going to Laguna from Manila – we recommend JAC Liner. Buses leave from both Cubao and Buendia terminals, and run very frequently all day long. The ride will take between 2 and 3 hours, depending on exact destination and traffic. It’s also possible to rent a van, which will cost you between 2000 and 4000 for the whole day. Price depends on availability and exact place you need to get to in Laguna. Speak to us first, and we’ll help arrange the van. It’s also possible to join a group and save costs that way. What to do in Laguna? In this section we’ll present the most popular tourists spots and attractions in Laguna, so you can pick the ones you like best. If you need more information about a specific item, just read its detailed review, or contact us with any questions. All these activities are perfect for a day tour out of Manila. You can also combine several, and create your own custom Laguna package. Once you’ve selected everything, click the book now button. Our experts will review your order, build a suggested itinerary, and help you figure out how many days it will require. Pagsanjan Falls are one of the most famous waterfalls in the Philippines, and a huge tourist attraction. It’s the most popular location for day tours in Laguna. Since the trip to the falls takes no more than 3 hours, it’s certainly possible to squeeze in another activity in a single day. That is, if you are willing to leave Manila early enough. Pagsanjan is located just a few minutes away from Santa Cruz – and most resorts there offer the boat ride to the falls. If you book the tour in advance through us, it will be slightly cheaper. The tour includes an hour long kayak ride through a narrow canyon full with thick forests. The kayak ride is actually the real highlight of the trip, as the view is spectacular. If your’e lucky, you might even see some monkeys jumping between the trees. Once you reach the falls, you can take a raft and go under it and into a small cave. You can swim for as long as you want, before heading back to the kayak and making your way back. If waterfalls are your idea of adventure, there is another option, which can even be combined with Pagsanjan. 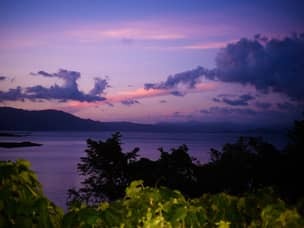 Consider visiting the less famous Ambon-Ambon Falls as well. They are admittedly less spectacular, but the advantage is you get there through a really fun trek in the jungles. Combining the two can make for a day full of nature and wildlife. There are many other waterfalls in Laguna, so if you wish to stay overnight and explore more, just let us know. 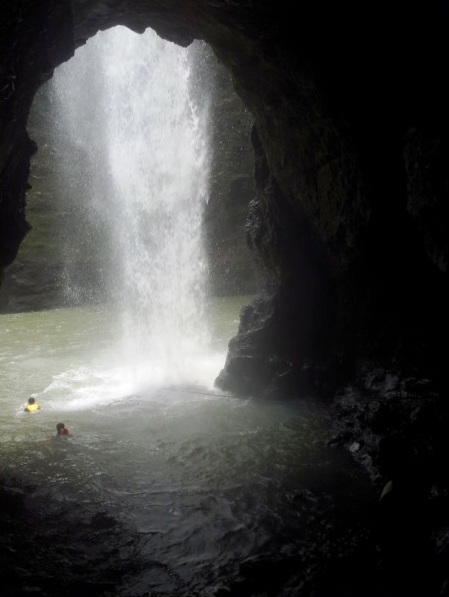 Cavinti is right next to Pagsanjan Falls, which are actually called Cavinti Falls as well. It’s very easy to combine both destinations in a single day, and we strongly suggest you do just that. The only problem is, Cavinti has so much to see that picking the places to visit could be tough. We’ll help you figure out the activities your’e most likely to enjoy. Those of you who have already been to the caves at Sagada or the Puerto Princesa underground river, will find Cavinti’s caves to be quite similar. The difference here is that the water flow isn’t so strong, so you can’t use a boat or a kayak and have to walk instead. Inside, you’ll see many beautiful rock formations and small waterfalls, as you make your way through the 3 chambers. Cavinti also has a nice old church, you can go inside and even climb the bell tower. Another nice spot is the Japanese Garden at Caliray Lake. The garden was built by the Japanese government back in 1970, to commemorate the deaths of all Japanese soldiers during WW2. Combined with the fantastic view of the lake, this well maintained garden is really a nice stop during your day tour. 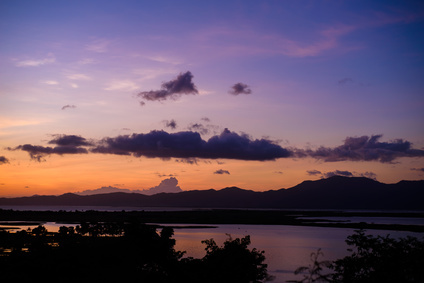 Lakes are the trademark of the Laguna province, and none compare to those of San Pablo City. Surrounded by no less than 7 crater lakes, San Pablo is sure to take your breath away. This tour focus is relaxation, since the main activity is just admiring the views. Swimming, cycling and kayaking are also available at some of lakes. We offer a complete seven lakes tour, which includes an overview of the area’s history and culture. However, if your’e feeling brave enough, we can also help you rent a motorcycle and do the grand tour yourself. It will take you between 3 to 4 hours to complete, and it’s a really nice experience. The lakes are perfect for families and older people, who wish to spend a day relaxing at their peaceful shores. Have a nice picnic by the lake, and spend your whole day enjoying the scenic views and quiet atmosphere. You could also drop by Villa Escudero which is only 10km away from San Pablo at the shores of Labasin Lake. The Villa, established in 1872, is a coconut plantation and a hacienda – where visitors can visit a museum and learn about local history and culture. If you are in Laguna and looking for some beach fun, Calamba is the place to go. The beaches here are wonderful, and full of fun activities and attractions. Wake-boarding, kite-surfing and all other water sports, as well as extreme rides. Calamba is also where most luxury beach resorts are located. You could have a really nice beach experience, at a 5 star hotel, for much cheaper than at one of the popular islands and beaches. Calamba is only 20 minutes away from Santa Rosa – where the Enchanted kingdom is located. This is the best amusement park in the Philippines and a huge tourist attraction. If you are traveling with children, or are just kids at heart, consider booking this tour. You can spend some time at the Enchanted Kingdom, then head to the beach for some more fun and excitement. How Does Laguna Fit Into My Travel Plan? Limited time offer : Rates as low as 40 USD a day! Laguna is a great day tour destination from Manila, and can easily be included in your Manila package. There are many fun ways to spend a day there, if all you need is a quick escape from the busy city. Alternatively, you can spend a few nights in one of Laguna’s nice resorts and explore the many natural wonders around you. Laguna is a perfect weekend destination for families and couples. We also can help plan your entire vacation, and build a complete itinerary for the whole Luzon area. Other noteworthy destinations nearby include Batangas, Tagaytay and Puerto Galera – All can be added to create a larger Manila package. Thank you for your interest in our services, it’s much appreciated. It would be easier to give you a price if we knew which attractions you’d like to experience exactly. One of our agents will mail you later today with some ideas for whole day tours and the price for each. We are sure you and your family will have a great time with us! Good morning, My family and I are planning to have our Christmas in Laguna. Our pick-up point will be at Turbina since we ‘ll be coming from Bicol. It will be on Dec. 24, 2017 am. We would like to visit Enchanted Kingdom, Sta. Rosa lights, Pagsanjan Falls, a church where we could attend a holy mass for Christmas, Rizal’s house and other places where you can suggest.We’re 8 by the way. Thank you for leaving this comment, we really appreciate this vote of confidence and we’ll do everything we can to make sure you and your family have a wonderful Christmas vacation. We can suggest plenty of other attractions, it really depends on how busy you like your schedule to be. Also, do you already have a place to stay at, or would like us to find a nice hotel for you near to the church you’ll be attending mass at? One of our agents will email you soon to work out all these details with you, but it would be very helpful if you’ll already have some ideas and which services you need exactly from us. Hope you’ll have a great holiday! Hi, it depends on dates. Please leave an inquiry here and fill out all relevant information. Please fill out our inquiry form, we can’t help without additional info.